How to Start Work with the Server? For the rack mounting you may need from 1 up to 6 RU (it depends on a model and server configuration) of the vertical rack space. Provide 1 RU of free space above and under the server’s system block, if possible. Place the SL NEO server’s system block into the equipment rack, provide the appropriate temperature conditions and ventilation. Connectors of the I/O boards are placed on the back panel of the server’s system block. 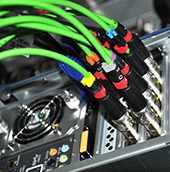 Connection to the BNC/XLR slots is implemented either through the breakout cables, or through the patch/trem panel, depending upon the type of I/O board and the version of server bundling. Connect an analog black burst signal from a tested and qualitative source for SD configurations or three-level signal Tri Level Sync for HD configurations to the proper input of the system block. Make sure that the frequency of vertical and horizontal synchronization is chosen correctly; in case of cascade connection make sure that the loop-through output of the signal at the last device is properly muffled by a terminator. Make sure that power cables are connected to all the PSUs of the SL NEO server’s system block. Also make sure that all the cables are supplied with electricity. Press the power button on the front side of the server. After turning on the power, the loading of BIOS and operating system will start. If an external disk array is attached to the server, it has to be powered up 20-30 seconds before the server. SL NEO servers come with pre-installed and activated software, in completely configured and ready to run condition. The password for entering Windows 7 OS is either 12345 or it is absent at all; for Windows 2008R2 it is QWE123qwe. Create a new password right after installing the server on the operating platform! After turning on the power supply and load of the operating system, you should launch the server software module. The appropriate icon «SL NEO Media Server» is placed on the Windows desktop. After the start of the server software loader, an icon of the loader Skylark Neovid, displaying the activity of the SL NEO server software, will appear in the Windows taskbar. The red color of the icon means that the loader works, but all other server software modules are stopped. The blue color of the icon means that the server software modules are functioning. Right-click on the icon SkyLark Neovid opens the menu that implements the start and stop of the server program modules. · Start Server – launches the previously configured SL NEO server software modules. · Stop Server – stops the SL NEO server software modules. · Administrator Control Panel - the control web-console of the server. It is launched when functioning the server software. After the start of the server software you can launch the client applications at the server itself and at the client stations (the main administrative client module is Air Manager). The server also contains a full set of client software that allows users to control all server functions, however, in the regular operational mode it is recommended to use the remote control from the network work stations. This is due to the extra load of the server's CPU by the client software and to low performance of the integrated video adapter of the server motherboard which is not intended for full video displaying. The server is supplied in set with the USB Flash drive, which includes drivers, files with factory settings, software installer packages, the complete set of documentation in PDF. The image of a system disk is placed on the RAID-array of the server. During the exploitation of the server it is not recommended to update BIOS, device drivers or install updates for the operation system with no necessity and consultation with developers. After changing the server IP address and turning on/off the network Ethernet-connection you should reload SL NEO server software. Processing power of all SL NEO servers corresponds the ordered configuration (the number, types and formats of input-output channels) with a certain margin. If you decide to change something on your own: the configuration, settings of the record and playout channels, SD-HD formats, change the codec to H.264 while recording or IP-streaming, you should monitor the level of the processors load of the server platform ( it shouldn’t be over 80-85 %). When setting a lot of streams/rules for Transfer Manager, the loading of the server processor may be close to 100%; it may have a bad influence on the recording and playback operations: freeze frames will appear during broadcasting and drop frames during recording. To avoid such situations you should monitor the CPU load and keep the 80-85 % level after changing the settings of Transfer Manager, especially after adding new rules. In case of working in HD mode, if you need to implement 4 or more parallel streams for moving media-files with transcoding, you need a separate computing platform for Transfer Manager. Don’t install any antivirus software to the server platform. While working, occasionally, the antivirus software activity leads to the appreciable increment of the load of server processors, and deep integration of this software to the operating system doesn’t allow any influence on its work.